When you want the durability and adjustability of Automaxx™ Clamping but you need more clamping capacity, turn to Automaxx™ Bar Clamps. These quality clamps automatically adjust to your material thickness, whether it's thick, thin, or in between. Clamp quickly and easily by simply sliding the clamp heads against your workpiece, and then squeezing the handle to close the clamp with consistent pressure every time. Setting the clamping pressure is simple, too. 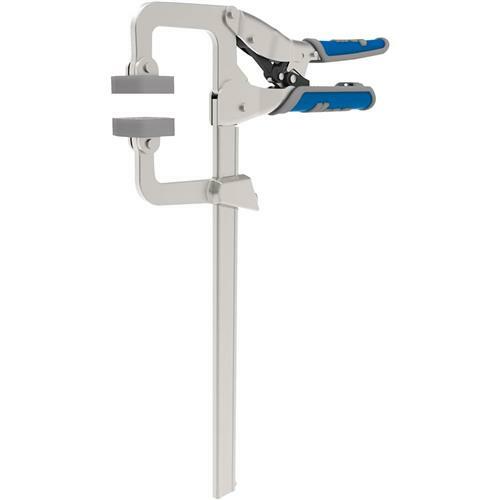 Just set the desired pressure using an easy to regulate thumbscrew, and Automaxx Bar Clamps do the rest—locking closed easily and consistently every time. These also feature a highly durable, all-metal construction to withstand years of rugged use. Their ergonomic padded grips provide comfort and ease of use, while extra large clamp faces spread clamping pressure evenly. 8" clamping capacity, with a 2-1/4" reach and 550 lb. of clamping pressure.